Like any fast growing community in the Toronto area, the Town of Whitby has to make choices about development that it will need to live with for decades. One of its biggest challenges is where to put increased density and new types of housing as it grows from its current population of 130,000 to a projected 200,000 in the next 10 or so years. But one area in Whitby where you won’t see over-development is its waterfont. I arrive at Heydenshore Park on the shore of Lake Ontario on a beautiful autumn day. My tour is led by Whitby Mayor Don Mitchell and Peter LeBel, the town’s commissioner of community and marketing services, and we head out for a walk along the Whitby Shores Waterfront Trail with its spectacular view of the lake. What’s not to like. It’s obvious that the waterfront, which extends from Ajax in the west to Oshawa in the east, is the town’s most cherished asset. We see the harbour, and just ahead, the Whitby Yacht Club, with 420 slips, which I’m told has won awards for sustainable practices, and “funds itself ” investing all money back into the trail and all the waterfront assets. There will be some enhancements to the area — plans call for a $3 million waterfront restaurant including rooftop patio to be built — and adding in more sandy beach areas. But the rest will stay as is. “This is not going to be a waterfront like they have in Toronto. None of that is going to happen here. We know we are a growing community but we will make sure the waterfront stays accessible,” says LeBel. Whitby is one of Canada’s fastest growing communities, and with good reason. 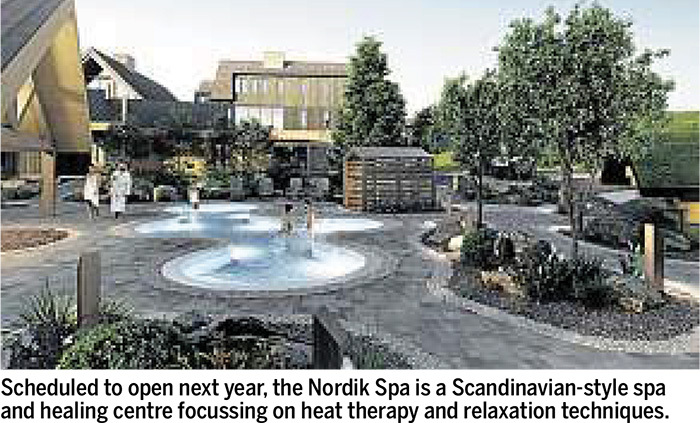 Other attractions include a historic small town, close proximity to nature (including 950 acres of parkland and 65 km of trails), recreational facilities, and coming soon, unique attractions such as the massive new Nordik Spa scheduled to open in fall 2019. On my tour, there is a lot for me to see. Further along the waterfront is Lynde Shores Conservation Area, and also nearby, the Iroquois Park Sports Centre, a world-class sporting facility that sees more than two million visitors each year. Then it’s off to downtown Whitby, where points of interest include the Whitby Public Library, and an assortment of unique shops with names such as M&R Cakes and Café Co and Cupcake Junkie. I also see Celebration Square, home to the Whitby Farmers’ Market, and the newly renovated ‘Innovation Accelerator’ which is set to open later this year and will help technology start-ups become market-ready and create new jobs. Finally, we arrive at Cullen Central Park, where new pickleball and bocce ball courts and a dog park are being built. Whitby would appear to be a very active and health-conscious community. “What we are trying to achieve is to balance off the residential growth with lots of amenities and attractions and the new jobs to support that,” says Mitchell. This is a town as equally friendly to seniors as kids, because “we all want the same thing, lots of nature and trails, and ways to move around other than vehicles,” he says. Mitchell reveals that he is a huge adovcate of walkable communities (a book called Walkable Communities by Jeff Speck is his personal urban planning ‘Bible’ and hands out to staff and developers). The plan is to building multi-use trails that connect all the parkland and recreation areas. A big opportunity is near the GO station area, where the town is planning for economic growth and exploring a transit village concept. Mitchell says the town is in discussion with Metrolinx to make this happen. And added to the housing mix will be condos which is a relatively new type of development for Whitby. For example, Dockside Whitby Harbour Condos is a new condo-townhouse project by Brookfield Residential Ontario and is currently in preconstruction. The new development will be located at 1900 Brock Street South. Also coming with occupancy planned for 2020 is Harbour Ten10, a five-storey boutique condo with amenities that include a social lounge with fireplace, an on-site greenspace with playground, a BBQ terrace, and dedicated rooms for yoga, games and parties. 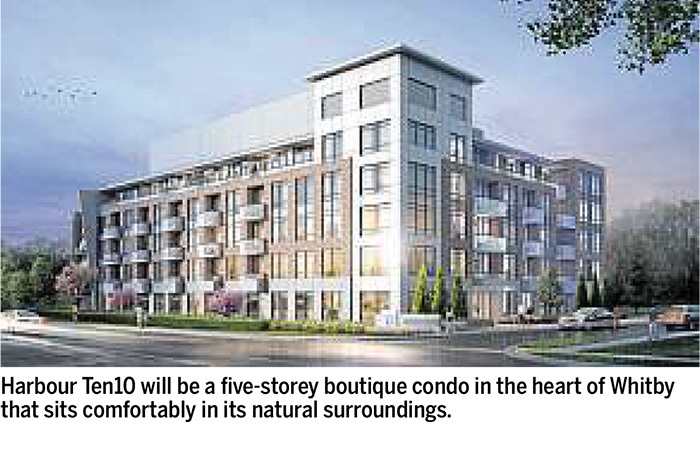 Ten10 name and address (1010 Dundas Street East), the site is less than a 10-minute drive from what buyers would want including the waterfront, Whitby’s downtown and the GO Train Station. Bhamani agrees condos are a relatively new concept to Whitby so the builder regularly puts on seminars that explain maintenance fees or get first-time buyers into the market. Most of the buyers at 1010 are young people and downsizers, and ‘into’ the lifestyle that Whitby offers.